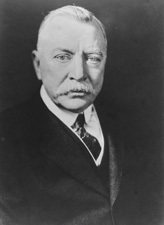 PHIPPS, Lawrence Cowle, a Senator from Colorado; born in Amityville, Pa., August 30, 1862; moved with his parents to Pittsburgh, Pa., in 1867; attended the common schools; entered the employ of the Carnegie Steel Co., advancing from clerk to first vice president; retired from active participation in the steel business in 1901; moved to Denver, Colo., and engaged in the investment business; donor of the Agnes Memorial Sanatorium in Denver; president of the Colorado Taxpayers Protective League in 1913; chairman of the mountain division in the Red Cross campaign in 1917; member of the Colorado council of defense in 1917; elected as a Republican to the United States Senate in 1918; reelected in 1924, and served from March 4, 1919, to March 3, 1931; was not a candidate for reelection in 1930; chairman, Committee on Expenditures in the Department of State (Sixty-sixth Congress), Committee on Education and Labor (Sixty-eighth and Sixty-ninth Congresses), Committee on Irrigation and Reclamation (Sixty-ninth and Seventieth Congresses), Committee on the Post Office and Post Roads (Seventy-first Congress); engaged in railroad and electric power investments; died in Santa Monica, Calif., March 1, 1958; interment in Fairmount Mausoleum, Denver, Colo. Dictionary of American Biography; Schlup, Leonard. Colorado Crusader and Western Conservative: Lawrence C. Phipps and the Congressional Campaign of 1926. Essays in Colorado History 9 (1989): 25-36.